My first glance at the bold caption ' Young man, did you went there?' annoyed me so much that I was muttering away to myself about the stupidity of the The Star magazine until I read the detailed write-up. I was put at ease that it had been done on purpose and it made me laugh over the few English sentences the writer mentioned. It was a humorously written piece with a good message to the readers on the present use of English in our country. To add something to his puns, let me tell you a story. Some thirty or more years ago, one of my close neighbours got very angry over the mysterious pelting of stones on his tin-shed rooftop house (some believed it to be the act of evil jins). It happened almost every day after dusk. One day he came out of his house shouting 'Who is the man dhillering on my basha?' His neighbours were amused by his choice of words which were often repeated until someone calmed him down. All in all, the article was a good laugh. It was enjoyable to read and laugh about the innovative use of Banglish. 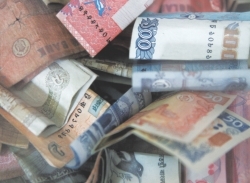 The inflation rate of Bangladesh is now approximately 12 percent. Inflation rate is considered to be one of the most important macro-economic indicators of an economy. Bangladesh's economy is at its worst at this moment. There are scores of reasons for rising inflation such as demand-supply gap, poor monetary policy, lack of proper government regulations and policy decisions, prices of different commodities across the globe, excessive expenditures on non-productive sectors or window dressing, import-export imbalances etc. Inflation contributes to the loss of purchasing power, decreases real income and has a pro-longed negative impact on investment. Given that we have a 12 percent inflation rate till date, our savings rate remains somewhere around 12 percent or below, demonstrating a negative investment at large. Now, consider its consequences: we invest in different savings instruments with the sole objective of a good return and end up with a lesser amount than what we had before in real terms. This is a nightmarish situation for the economy. Inflation lessens liquidity in the financial sector as people withdraw their savings in order to meet current expenditures. This results in rising interest rates, higher import costs, reduction of foreign exchange reserves etc. It is hard to survive in such an economic phase where people are struggling to meet even their basic needs. Hence, policy makers should take drastic measures to rectify the current situation. The high officials of the Education Ministry and the Minister himself often say that coaching centers should be banished. They seem to think that if the coaching centres are restricted, students will ultimately be more interested in the class room. But the real situation is different. Students throng to the coaching centers because they are not satisfied in the class room. Their syllabus often remains incomplete before the exam. They don't have any opportunity to ask anything to their teachers. However, teachers cannot always be blamed for poor class room performance. It is not possible for a teacher to check the scripts of about one hundred students, which is the usual number of pupils in almost all the government schools. In addition, a teacher has to take many classes per day. So it is difficult for them to remain enthusiastic enough to deliver an excellent lecture. The Education Ministry should keep the number of students within such a limit that a teacher has sufficient time to give lectures and check scripts. Our curriculum should be up-to-date so that students feel interested to stay in the class room. Student-teacher relationships should be easy. Teachers and guardians should have regular meetings. The article entitled 'Duped' in the previous issue was an eye-opener and provided an excellent description of how several fake companies are taking advantage of the falling economy. The concerned officials should take strict measures and close-down these organisations before several other fresh graduates are robbed of their money. The fact that such businesses continue to thrive poses plenty of doubts over the performance of the regional thanas. It won't be a surprise to find the police and other authorities involved in this scam. At a time when the country's economy hangs by the thread, matters like these should be taken to the highest possible authority and be quashed as soon as possible. I congratulate The Star magazine to have come up with this investigative piece and am looking forward to reading similar articles in the upcoming week. I was fascinated by last week's story on fraudulent recruitment companies in the capital. It is something I was completely unaware of. Having read investigative stories abroad, it was interesting and encouraging to see a Star journalist going undercover to bring the issue to our attention. It's hard enough finding a job in the current economic climate, so for the unemployed to be exploited is not only unacceptable but appalling. Another equally unacceptable and appalling practice written about in the magazine was the abuse of poor village children by their schoolteachers. It was shocking to read the methods they use to milk money from already impoverished parents. I would have been interested to understand more clearly whether the writer was suggesting that corporal punishment continued despite the law against it which was passed a year ago. If so, what the government doing to ensure children, right to education?